Before commencing with our presentation related to Pope Francis and the fulfilled prophecies given to Maria Divine Mercy, it is our desire to strongly attest that the intent of this article is not meant to assail or defame the person of Jorge Bergoglio. It is truly not our wish to spread hatred towards anyone but rather to expand awareness and attentiveness with a peaceful spirit, using verifiable information, our own objective reasoning, and discernment. “His lies will enthrall a naïve group of Catholic followers. He will present a wonderful and loving external charisma and all of My children in the Catholic Church will be confused. In this article, we will list (so far) some of the fulfilled prophecies present in regards to Pope Francis – the False Prophet – his words and his actions as well as the events, changes and circumstances surrounding him. We provide such ‘fulfilled prophecies’ in the form of objective and widely known information, as their reportage comes from mainstream media. All the words contained in the articles’ screenshots are meant to be read as to understand, in depth, the whole context. Also, the use of prophecy is not intended to sensationalize but rather, it is to connect all the visibledots inside a larger picture that none of us can either know or fully understand. Further, our choice to prove the veracity of the content within Book of Truth given through Maria Divine Mercy is in no way whatsoever propagandistic or manipulative as The WILD VOICE prioritizes the spreading of truth through actual facts and existing documentation. Nothing written herein is conspiratorial or subversive (in nature or intent) towards the Holy Catholic and Apostolic Church, which we honor and belong to. Contrarily to what many may believe, our mission is to defend the Church from the attacks within It. Therefore, we claim to accomplish the spreading of true and proven information based on real facts – independently from prophecy but coinciding with prophecy. We additionally claim obedience to the Catholic Church by honoring God’s Truth contained within It and by defending It always – whether the attacks are from within or without. LASTLY: some of the listed fulfilled prophecies are at their beginning stages. Therefore, as they will intensify over time and be officiated in the near future, it will become obvious to many that the prophecies given unto Maria Divine Mercyare undoubtedly from God. Have a good read and May God always assist you. Amen. All of the below quoted prophecies may freely be read and downloaded in their entirety here. NOTE – THIS PAGE IS ONLY OCCASIONALLY UPDATED AS MANY MORE ACTIONS HAVE BEEN TAKEN BY ‘POPE FRANCIS’ SINCE THIS ARTICLE WAS ORIGINALLY PUBLISHED. IMPORTANT NOTE: Official changes have not yet occurred as of June 5, 2014. A synod will be held in October 2014. Next Post Book of Truth Prophecies Fulfilled – Part 1. This confirmed my. Fear that Pope Francis is the anti–christ! I had read he would be in Rome. Jeuss will return to Isreal. Hi Pat, Francis is not actually ‘the’ Anti-Christ. He is his right hand man. The False Prophet (Francis) and the Anti-Christ work hand in hand. It is easy to confuse the two. The False Prophet lays the groundwork and does much of the talking. The AC hasn’t appeared yet but he is waiting in the wings. When he appears, do not watch him on TV or listen to his voice.He will be very seductive. You should wear the Medal of Salvation and pray the accompanying prayer as Our Lord promises protection from the AC for all those who accept it. Thank you Lord!! 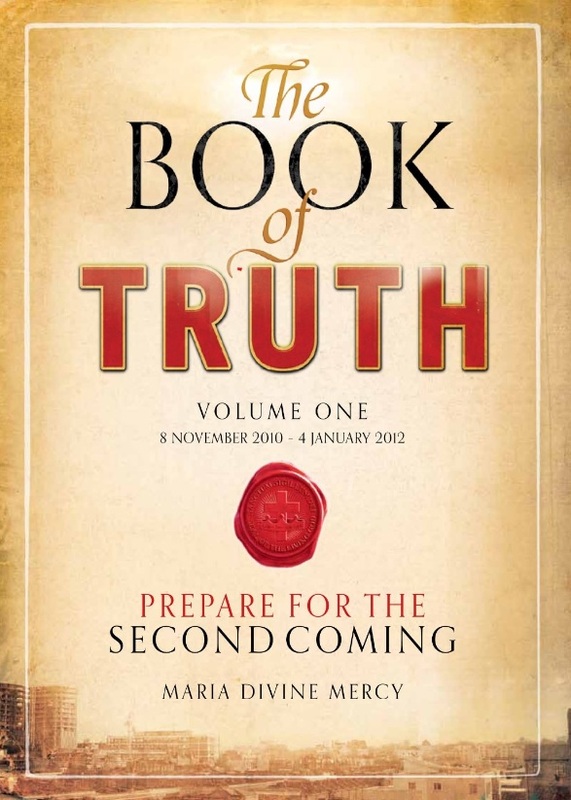 Here we want to show people that the prophecies which are being given to us in the messages of the Book of Truth, are in fact coming true and that these messages are authentic. Please go to one of the sites mentioned below and read the messages, or download the entire Book of Truth in PDF format. They are meant for everyone.